Why do this ? Simple, it’s easier to troubleshoot. By having a different source address for each VIP it’s much easier to sniff traffic. 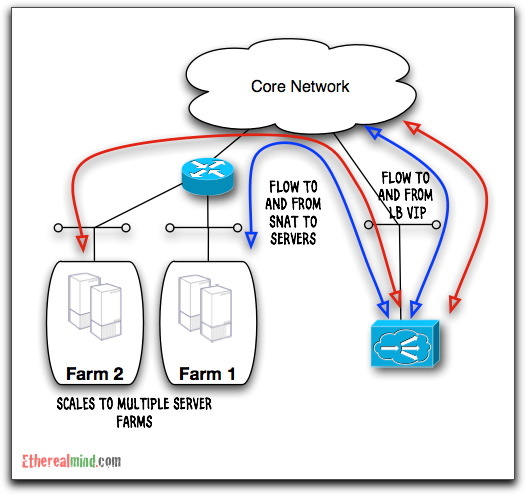 Remember that each server farm will have multiple servers and troubleshooting flows is harder is you have to specify the IP address of each server in the farm, this way you can capture packets from LB to Server for each VIP by using the NAT source address. Second, if you need to migrate LB in the future, then each VIP is logically decoupled from the other. You can use a different subnet for each VIP / NAT set so that migrating LB VIPs around your corporate core is nothing more than a routing issue. !Define the load-balancing policy - here a simple sticky round robin. !Define the interface and allow the traffic in and out the interface. !Define two NAT Pools for each VIP. !Apple the service policy for load balancing to the Interface. I agree, it looks like this config is almost exactly like the first example, with the addition of a second NAT pool. Greg still needs to add more rservers, a second serverfarm, a second VIP, etc. BTW, thanks for sharing this info Greg. I am still learning how to master the ACE. GREG hello how are you, I wanted to consult you as follows: I am currently doing a migration from a content services switch to a ACE load balancers. The customer segment does not have valid IP addresses to place in parallel with ACE load balancers. Within the content switch and there is 4 applications to migrate one by one. Is it possible to configure a customer segment the network IP addresses of 192.168.20.0 / 24 with a virtual network address 172.16.16.1 for example? Basically what I want to validate whether it is possible to use a VIP address on a different network segment the client vlan. Hard to know for sure without more details, but I think the answer is yes. Just make sure your routing is configured correctly.